Chris Butler’s mixbooks are an reversal of the popular trend towards e-books: they scrape and un-digitize and materialise bits from the internet, regressing them into paperback format. Also, making your own book of your favourite articles is just a fun thing to do. 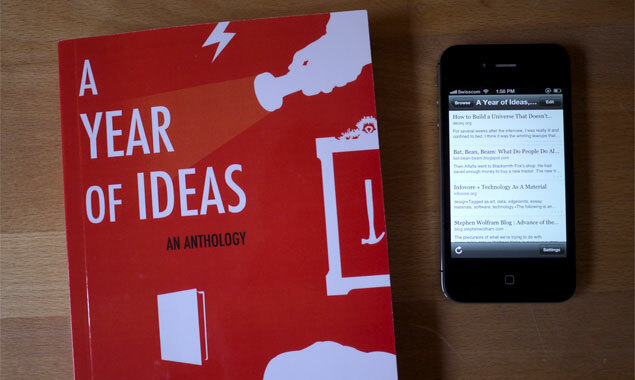 The 2011 edition of A Year of Ideas is near the top of my reading pile, and the timing is perfect: I’m about to go traveling, three months backpacking in Asia – oh yes. I’ll be offline most of the time, so I’ll bet this collection of web articles can provide the internet dopamine hit that my RSS-addled brain will no doubt crave. But I’m trying to pack light. Books are heavy. Bringing a Kindle is a no-brainer. So I decided to go online and save all the web articles featured in the mixbook, and now I can read them on Instapaper while I’m away. Onward the mixbook goes, cycling back and forth from analog to digital. It’s like “Read later” Inception.